Thinley Norbu Rinpoche or Dungsé Thinley Norbu (Tib. གདུང་སྲས་ཕྲིན་ལས་ནོར་བུ་, Wyl. gdung sras phrin las nor bu) (1931-2011) was a prominent modern teacher in the Nyingma lineage. As the eldest son of Dudjom Rinpoche, he was trained in Tibet and became a main Dudjom Tersar lineage holder. Recognized as an incarnation of Tulku Trimé Özer, one of seven sons of Dudjom Lingpa, he was also considered to be an emanation of Longchenpa. Having lived in Bhutan, he finally settled in New York (USA) where he gathered students. He authored many books in English. Among his sons are Dzongsar Khyentse Rinpoche and Dungse Garab Rinpoche. I was born in Lhasa, between east and west, in the center, near the Rasa Trulnang Tsuklakhang (Temple of Miraculous Goat-Earth Phenomena) in Lhasa, kown as the Jokhang Temple. My family, like the Seven Northern Stars, had seven children. As Buddha Shakyamuni said, ‘By nature, all worldly gathering has its end in separation’, and so I was separated from my family when I as eight years old . 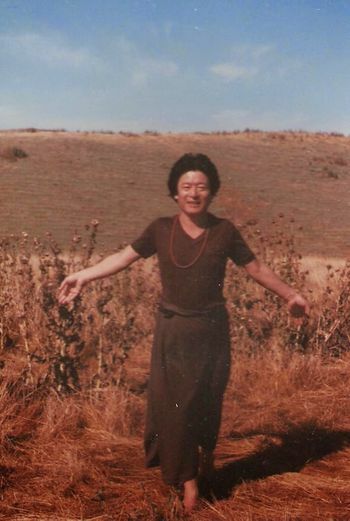 At that time, I went to study the Holy Dharma of Tibet at Mindroling Monastery (Sublime Island of Ripening Liberation) under the direction of Yönten Kunjung Rinpoche (Jewel of the Occurrence of All Qualities) and stayed there until I was seventeen years old, studying language, rituals, and philosophy. The head of the monastery was named Minling Chung Rinpoche, Ngagwang Chödral (Younger Jewel of Conquering Speech of Dharma’s Renown, 1908-1980). His morality was as precious to him as his own eyes, and his constant discipline seemed to come directly from the most serene face of Buddha Shakyamuni. One of my teachers was a wise and great doctor named Dordzin Dechen Chödzin (Great Bliss Dharma Holder of the Vajra). He healed countless patients impartially like a Bodhisattva. Wherever he went, the smell of natural medicine accompanied him, like a messenger from the Medicine Buddha pureland. Another one of my teachers, named Lodrö Gyatso (Ocean of Intelligence), taught language, rituals, Vinaya vows, bodhicitta teachings, and Vajrayana samaya. With his magnificent form and thick black beard, he seemed like a trainer sent from a powerful wisdom king to subdue my wild elephant mind with his skillful hook. In general, life in the monastery was very ascetic. […] I stayed in the monastery for nine years [19, and during that time I saw my parents only three times. When I was thirteen years old , I heard one of teachers whispering with his friends that my parents had separated, but I didn’t understand clearly what he meant. When I was seventeen and years old  and went to visit my parents in the center of Tibet, I still had the habit of seeing them together, but when I arrived at my father’s house, I couldn’t find my mother because they had separated homes. For a moment, I felt as if I had lost my precious heart. Soon my mother sent for me, and I went to see her with my brothers and sisters who were staying at home, and from then one, we went back and forth between our parents’ houses. At that time, my energy had become so constricted and my elements were under so much pressure from many years of pretending to be disciplined in the monastery that I exploded like a volcano. I became wild, riding horses, swimming in the river, arguing with young boys, and playing with my brothers and sisters. After a while, when my father asked me to return again to the monastery, I said, ‘No! I would rather jump in the river and die.” [My father] said ‘If you don’t want to return ton Mindrolling, then you must go to the famous Dzogchen Monastery ‘Glorious Lion Great Perfection Monastery in the East)’. But again I replied that I would rather jump in the river and die. Finally, he didn’t send me to either the monastery and took me instead to his residence named Dechen Teng (Superior Great Exaltation) in Kongpo (the Forest Valley Land). […]. At that time, [in Dechen Teng (Superior Great Exaltation)], I had some other teachers in Kongpo. I learned grammar and practices from (Tall Stone Emanation), and with Understanding Phenomena I studied Letter to a Friend by the Lord Nagarjuna. From Lama Orgyen Rigdzog (Vidyadhara of Oddiyana), the disciple of Khenpo Ngawang Palzang (Great Scholar Victorious Speech), I listened to the Seven Treasuries and the Trilogy of Natural Freedom by Longchenpa, who is the emanation of Samantabhadra, and to the Nyingtik Yabshyi and Longchen Nyingtik. I listened to Dilgo Khyentse Rinpoche ‘s reading and teaching of the king of tantras called Guhyagarbha Tantra, and teachings of two of its commentaries, Dispelling Darkness in the Ten Directions by Longchenpa, and ‘Ruler of the Secret Teachings Wisdom Heart’s Ornament’ by the great translator Lochen Dharmashri. From Dodrupchen Rinpoche (Able Teaching of Noble Activity), I took the initiation of Nyingtik Yabshyi (Four Heart Drops) by Longchenpa, and listened to the reading of the Yönten Dzö, written by Jikme Lingpa (Fearless Islander), and two of his commentaries on it, ‘Chariot of Two Truths’ and ‘Chariot of Omniscience’. I listened to Chadral Rinpoche (Enlightened Indestructible Freedom From Activity)’s reading of the Flight_of_the_Garuda (Song of the Wave of the Garuda’s Wings) by Shabkar Tsokdruk Rangdrol. From Gojo Orgyen Chemchok, I studied the stage of the transformation of ordinary appearances into pure deity appearance and the stage of characteristicless completion, and stayed in tantric samaya’s inner Triple Gem retreat a few times under his guidance. […] After that, I stayed with my father, taking initiations and teachings with his disciples, sometimes in small groups and sometimes in large group. At the age of eighteen, I started my own life. For seven years, from the age of eighteen to twenty-five, I gathered experience. I spent some time sustaining a monastery that my father had given me when I was a young boy. There was a connection between the monastery and myself, because once, during my childhood when I was eight years old and my father was giving teachings there, I recovered from an illness after they made a ritual Long life practice prayers for my health. The monastery was old, like an exhausted, haggard man, and there were about sixty peasant families connected to it. During those years, I had many problems through inexperience. I spent some time visiting, teaching, and traveling. One retreat place where I stayed was called Len Ri Dewa Chenpo (Accepting Mountain of Great Bliss). Later, I went to Central Tibet and visited with many lamas: Polu Khenpo Dorje, Chadral Rinpoche, and truly Rimé lama Jamyang Khyentse Chökyi Lodrö, who embraced the teachings of all sects. I met him for the first time at Samdrup Podrang. Later, I met all of these lama again. I met Jamyang Khyentse Chökyi Lodrö in Sikkim, where I received teachings on Trekchö and Tögal, and I met Polu Khenpo Dorje, from whom I received teachings on Samantabhadra's Aspiration to Good Actions, and on the Guhyagarbha Tantra and its commentaries. Later, [in mid 1950’s], Thinley Norbu Rinpoche met his future wife’s sister, Semo Tsering Chökyi-la, in Sikkim, who organize him to come to Buthan. There, he met Sangyum Jamyang Chödron-la (Smooth Melodious Lamp of Dharma), daughter of Lama Sönam Zangpo who became his wife. They stayed together a few years in Beyul Khenpa Jong (a beyul in Bhutan, sacred to Padmasambhava). Thinley Norbu Rinpoche was the chief architect of the Thimphu Memorial Stupa, which he built under the guidance of his father, at the request of Her Majesty Ashi Phuntsho Choden of Bhutan. According to Thinley Norbu Rinpoche,: ‘I had started to read some Dharma to others when I was nineteen years old and had begun further teaching from the age of twenty-four. I traveled many times in India and had different spiritual friends in different places. I especially traveled in the North and East, and later, when I became sick, I had to spend time in several medicine houses there. […] My sickness didn’t heal, so friends of friends invited me to the West fro treatment. At that time, Dudjom Rinpoche asked his son Thinley Norbu Rinpoche to go to the West to teach. Thinley Norbu Rinpoche spent the last three decades of his life in the United States, living in New York City and then rural New York State and in the desert in California. He dressed simply, often just in a shirt with a bath towel wrapped as a sarong. He and his environment were impeccably clean. He had no dharma centers; the students who gathered around him practiced in his home and in the homes of fellow practitioners. He made little fuss about anything, and practiced every evening with his students, whether it was just a handful or a score. One of his main teachings was about the continuity of practice meditation, offerings, and becoming familiar with Buddha and deity phenomena. His approach was simple, direct, and profound. He taught that development of the proper view and faith was paramount—faith meaning that once one had heard and considered the teachings, one actually put them into practice. Every one of his students, including myself and my immediate family, were continuously blessed by his profound instructions, in the same way that practitioners in the past must have been blessed by the likes of Saraha, Padmasambhava, and Longchenpa. His American community was an interesting mixture of males and females of all ages and almost equally made up of Tibetan/Bhutanese, Chinese, and Westerners—all practicing as one harmonious group. He put particular emphasis on teaching and training his youngest disciples; some trained from birth and others trained continuously from a very young age into their twenties. He held nothing back. They were trained in meditation, sadhana, dharma dance, scholarship, and discipline. This young group of disciples will be an important legacy to the world. His son, Dungse Garab Rinpoche, will continue their training. Though living the quiet life of a householder yogi, Buddhist teachers from all over the world came to meet him and receive teachings. He was a teacher of teachers. Thinley Norbu was also a brilliant writer. He often apologized for his “bad English” despite using the most accurate vocabulary and nuances of the English language. His magnum opus, The Cascading Waterfall of Nectar, contains the pith teachings of the complete Buddhist path up to and including Dzogchen. It will be studied and appreciated by those fortunate enough to be challenged by it for centuries to come. His retreat center in the rural New York State is called ‘Kunzang Gatshal’. During this several decades, Thinley Norby Rinpoche traveled back several times to the East. In 1986, he went back to Tibet ‘where he quietly and tirelessly have many teachings to Tibetan disciples’. Thinley Norby Rinpoche also taught a lot at Pema Osel Ling, California, the center of Lama Tarchin Rinpoche. 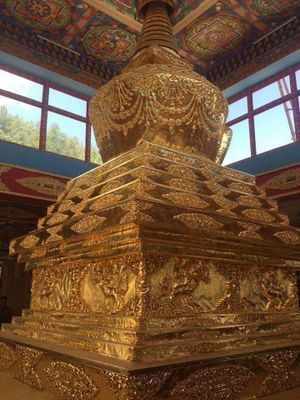 Facing the purkhang (cremation) from the west, the reincarnation of Dudjom Rinpoche, Dudjom Sangye Pema Zhepa Rinpoche, performed the Dorje Sempa Lama Chodpa ([[Vajrasattva] was dressed with Sambhogakaya attributes . Facing the purkhang from the north, south and east, the reincarnation of Lama Sönam Zangpo, the reincarnation of Bartsam Lama, Pema Wangchen, and Yonphula Rinpoche Jigme Tenzin, performed Tröma Nakmo tsok offerings, surrounded by thousands of Tröma Nakmo practitioners, all chanting with ritual damaru and bells. […] As Khandro Kuenzng lit the fire, facing the purkhang, the two daughters of Thinley Norbu, Pema Choki and Kesang Wangmo, from right and left, accompanied by his younger son Urgyen Namgyal, lit the kudung from the other directions, while the two elder sons, Dzongsar Khyente Rinpoche and Dungse Garab Rinpoche, offered various objects in the jinsek ceremony. A thoepa (skull) and tsem (six teeth) were collected from the remains, purthel (ashes) and kuri (bones) of Thinley Norbu Rinpoche, five days after the purjang (cremation) on March 3 in Dagophu, Paro, Bhutan. The remains were collected from a 25 feet tall purkhang chorten (crematorium), coinciding with the 15th day of the first Bhutanese month, in a traditional procession. The phurkhang, which stood on an intricately carved dais, with a traditional roof over it, and held by four pillars painted with Bhutanese designs, remain untouched until the remains were collected. Home minister, Minjur Dorji, who was present during the collection, said the skull and six teeth were found without even a burnt mark. 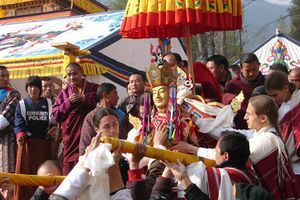 ‘It is a miracle and we should all be proud for being able to conduct the purjang in Bhutan”, lyonpo said. […] Lopön Sonam from Bartsam, who initiated in designing the purkhang, said the purkhang’s inside were the kudung was cremated had turned white.” There was no sign of fire”. A memorial of Thinley Norbu Rinpoche has been built on the site of his cremation in Paro, Dagophu Bhutan, by Dungse Garab Rinpoche. This time is the saddest for our lives because our lord protector, Samantabhadra in human form, Kyabje Dungse Thinley Norbu Rinpoche, temporarily left his body. There is nothing sadder than this in the world from a relative point of view. But ultimately, Rinpoche’s wisdom and compassion has never left us. His omniscient wisdom and compassion are always holding us within our hearts. But even Rinpoche temporarily leaving his physical body is most painful. He is the sun around which the four continents revolve, and now temporarily this sun has set. We are like small children, immature and undeveloped in the qualities of our path – our meditation and realization. We are like orphans, little babies left behind without our parents to care for us. What can we do then to again have our parents return? We can keep pure samaya and do practice continuously, accumulate positive karma, recite Kyabje Dungse Rinpoche’s rebirth prayer, and do Vajrasattva practice since Dungse Rinpoche and Vajrasattva are in fact inseparable. We can keep our pure samaya practice clear and stainless like a mirror. That way Kyabje Dungse Rinpoche’s emanation will reflect in the clear mirror of our pure mind. On a physical level it is not realistic for us to expect that Kyabje Dungse Rinpoche can stay with us forever. His passing into parinirvana is a teaching on impermanence. It can help us to remove our lazy habit, always thinking we will have time to practice later, later. By meditating on impermanence we can accomplish our practice. We have to remember that we did receive Kyabje Dungse Rinpoche’s incredible teachings, which are unlike those of any other teacher. Rinpoche gave us the essence of his Kuntuzangpo wisdom mind directly in the palm of our hands. We did receive this precious gift from him. Our job then, what we are responsible for, is to keep Rinpoche’s blessings warm in our heart without forgetting them. We can heat them up and keep his wisdom mind alive and inseparable with our own mind. That is what is truly reliable. From that ultimate point of view, we don’t have any separation with Rinpoche. That connection will last forever within our hearts. Please keep that. Thinley Norbu Rinpoche was a shining star in this very darkened world that we live in. I grew up in the Tibetan monastic system, I had contact with many elderly lamas, whom I received teachings from, and they all passed away one after the other. In recent years I had no connection with lamas of that generation except for His Eminence Thinley Norbu Rinpoche. He was very generous in accepting me to be one of his students. I had the great fortune of spending time with Rinpoche and being in his presence over a prolonged period of time. I am saddened by his passing, as are many devoted followers. He was an exceptional teacher. His Eminence embodied two qualities, which are essential in Buddhism. One is learning and the other is practice. Due to his learning and impeccable conduct he attracted Tibetans, Nepalese, Bhutanese and even people from East Asia and the Far East. As many of you would know Rinpoche was the eldest son of His Holiness Dudjom Rinpoche, a very accomplished and incomparable Nyingma Master. I also had the opportunity to meet with His Holiness and in fact I attended pujas on several occasions with him in Darjeeling. The first time I met Thinley Norbu Rinpoche was in the 1960s when I was at Thuksey Rinpoche 's monastery and reconnecting with him years later was a great blessing for me. Personally, I think Rinpoche possessed all the qualities that His Holiness Dudjom Rinpoche possessed. He was a great scholar, a great meditator and very compassionate. The kind of role model that is very difficult to find in this changing world. there is nothing that is not excellent. So it is. 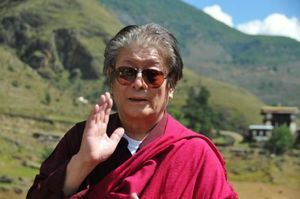 Thinley Norbu Rinpoche was a quintessential Dzogchen master of modern times, forever loyal and faithful to the lineage of pure wisdom awareness. Whoever had the good fortune to encounter him was either directly or indirectly led toward their innate buddhanature. Often Rinpoche would use himself as an example when teaching or giving pointing out instructions, as though he was the one learning what was being said. One time he told me that even though contemplating impermanence was a crucial step on the path to liberation, without the view of the deathless Dharmakaya, it could lead to depression and lethargy. He said that to uplift himself, he would bring the thought of impermanence into the view of the deathless dharmakaya; in this way he could look forward to death, knowing that there was no death from the point of view of the three-kaya-wisdom buddhanature, and that this nature permeated every aspect of our reality. During the more than thirty-five years he taught in the West, Rinpoche’s most consistent, crucial instruction was to always have faith and confidence in the three-kaya-wisdom buddhanature. Rinpoche was adamant about maintaining the purity of the wisdom lineages traced back to Guru Padmasambhava and Lord Buddha Shakyamuni and spoke out with impeccable logic against anyone who tried to water down or change the truth to meet their own modern agenda. To be a disciple of Rinpoche was to undergo a core level transformation that would leave one’s ego and self-grasping baseless from the root. How amazingly fortunate we were here in America that Rinpoche decided to live among us and work deeply with disciples, young and old, to sow potent seeds of authentic transmission that will endure for future generations. Though there are many accounts of amazing teachings that occurred in my own personal relationship with Rinpoche that have shaped and directed my life, one story is my all-time favorite. Many years ago I was suddenly asked to go to a venue where Rinpoche was teaching for several weeks and offer English translation so that he could speak Tibetan and conserve energy. Warned by colleagues that for various reasons no translator lasted more than a short while when working with Rinpoche, I was decidedly nervous. I took my seat and did my best that first night, and much to everyone’s surprise Rinpoche did not stop or criticize me, and the teaching concluded without incident. The second night, I took my seat and one of the attendants came over and said she needed to tie a small cord around my big toe, and the other end would be in Rinpoche’s hand. As she tied the cord around my toe I looked up and saw Rinpoche gazing down upon me with a mischievous smile. Then the fun began. Rinpoche explained to me that even though he did not know English very well, if there was a word or phrase that might need adjusting while I was translating, he would simply tug on the cord to indicate I should stop speaking. He would then speak to me quietly in Tibetan and suggest another way to translate something. For those of you who never met Rinpoche, he was extremely polite and gracious. So the teachings began, and as I spoke he repeatedly tugged on the cord. He would then ever so kindly help me find a better way to express the teaching, based on a choice of terms that brought out the wisdom perspective. This process continued for several days, with most of the attendees oblivious to what was going on. Then one night, the cord was not tied to my toe and I knew that Rinpoche trusted me to represent what he was teaching in the way it should be expressed. He empowered me to know how to let the wisdom blessing pass through me without ego or pride so that the listeners could hear and feel exactly what he had said. This experience was a turning point in my life and has given me the opportunity to refine translation work and develop a sense of confidence that otherwise would not have happened. Even though Thinley Norbu Rinpoche was among the greatest scholars and realized practitioners of our time, he never referred to any of his thousands of disciples as “his students.” Rather, he referred to us as friends. He believed Western teachers and translators needed to be aware of the problem of pride, which he referred to as the ugliest and most detrimental of the five poisons. This was just one of the ways he demonstrated the teachings. Thinley Norbu Rinpoche's sons and daughters are Dungse Garab Rinpoche, Jampal Dorje Rinpoche, Dzongsar Khyentse Rinpoche, Se-Ugyen, Semo Kalsang, Semo Yeshe, and Semo Pema. On October 2015, Dungse Gyanata Rinpoche, son of Garab Dorje Rinpoche, was recognized as a reincarnation of Thinley Norbu Rinpoche. ↑ Thinley Norbu Rinpoche (A Brief Fantasy History of an Himalayan, Shambhala, 2014, page 12. ↑ Thinley Norbu Rinpoche (A Brief Fantasy History of an Himalayan, Shambhala, 2014, page 98. Lhasa (Land of the Gods) was originally called Rasa, which meant ‘Lands of Goat’, since goats carried the earth and stones to build temple. ↑ Thinley Norbu Rinpoche (A Brief Fantasy History of an Himalayan, Shambhala, 2014, page 13. ↑ These are Jigme Lingpa's own commentaries: they are the first two listed in the commentaries section on the Yönten Dzö page. ↑ Thinley Norbu Rinpoche (A Brief Fantasy History of an Himalayan, Shambhala, 2014, page 19. ↑ Thinley Norbu Rinpoche (A Brief Fantasy History of an Himalayan, Shambhala, 2014, page 20. ↑ Thinley Norbu Rinpoche (A Brief Fantasy History of an Himalayan, Shambhala, 2014, page 33. ↑ Thinley Norbu Rinpoche (A Brief Fantasy History of an Himalayan, Shambhala, 2014, page 51. ↑ Text published in ‘Buddhadharma: the practitioner’s quarterly summer 2012’. Samuel Bercholz is the founder and chairman of Shambhala Publications. He studied with Thinley Norbu Rinpoche for more than two decades, and has been teaching Buddhism and the Shambhala teachings for nearly four decades. ↑ Thinley Norbu Rinpoche (A Brief Fantasy History of an Himalayan, Shambhala, 2014, page 79. ↑ Sangye Khandro, ‘Pulling Strings’, published in Buddhadharma: The Practitioner’s Qaurtely, Summer, 2012. This page was last edited on 8 May 2016, at 22:15.